My favorite of all weekend meals occurred again this past weekend: the brunch. Brunch has so many opportunities for deliciousness. Plus, it's like one ginormous snack for my kids. Since it usually occurs around 10ish, they've already had a small breakfast. When they're ready to ask for Goldfish crackers mid morning, you blow their mind by giving them a second, better, breakfast. It's even better when you are invited somewhere else for brunch and they get new toys and surroundings out of the deal. This all happened a couple days ago. I was asked to bring muffins or scones. Anyone who knows me well at all, knows that I think scones are a waste of time. I've never met a scone that really grabbed me. They need to be marinated in butter or lots of syrup or whipped cream or something to redeem themselves. So I chose to make muffins. I went to try a new muffin recipe, and then realized that I didn't have several of the ingredients called for: namely, yogurt. I dug deep into my consciousness and then remembered that I've subbed sour cream (my favorite condiment outside of ketchup) for this in the past with great results. Then I realized I didn't have enough sour cream to fully substitute the yogurt. Hmmmm....didn't I make a chocolate cake once that had mayonnaise in it. Wasn't it delicious? Ok, add some mayonnaise. Wait, I don't have enough mayonnaise to make up the remaining shortfall either?!? Throw in some milk. 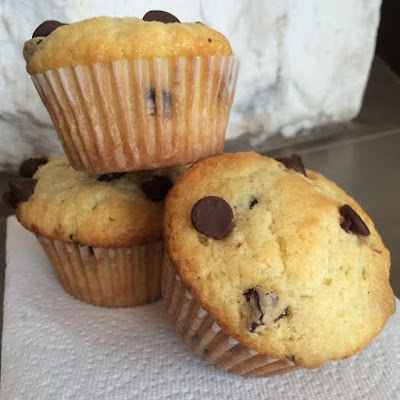 The result: amazingly moist and delicious chocolate chip muffins that are still holding their own, 4 days later. I think this is a bold statement for any from-scratch white cake product. Behold: my re-invented chocolate chip muffin. You're welcome. PS. My kids thinks the raw batter is top notch too. Yes, they eat raw batter. Lots of it. I grew up doing this and lived, so they should too. Cream together softened butter and granulated sugar. Add eggs and vanilla and beat until thoroughly combined. Add mayo, sour cream, and milk and thoroughly combine. In a separate bowl, stir together flour, baking soda, and baking powder. Add to wet ingredients and stir until just combined. Fold in 2/3 cup chocolate chips. Fill paper-lined muffin cups 3/4 full. Sprinkle a few of the 1/3 cup remaining chocolate chips on each muffin. This is purely for presentation purposes. You can skip this step and just add the full cup to the batter instead. Bake in a preheated 350F oven for between 18-22 minutes.